« Do Topic-Dependent Models Improve Microblog Sentiment Estimation? The problem with agreeing to teach is that you have less time for blogging, and the problem with a hiatus in blogging is that the topic you were in the middle of discussing gets overtaken by questions of more immediate interest. I hope to return to the question of simulating assessor error in a later post, but first I want to talk about an issue that is attracting attention at the moment: how to select documents for training a predictive coding system. The catalyst for this current interest is “Evaluation of Machine Learning Protocols for Technology Assisted Review in Electronic Discovery”, recently presented at SIGIR by Gord Cormack and Maura Grossman. In fact, there are two questions, somewhat conflated in Maura and Gord’s paper. The first is, should the initial seed set of training examples be selected by random or by judgmental sampling (for instance, based on a keyword query)? The second is, having seeded the training cycle, how should subsequent training examples be selected? I’ll tackle the second issue here; I hope to return to the first in a later post. Random Draw a simple random sample of the unlabelled documents in the collection. Uncertainty Select those documents whose responsiveness the predictive coding system is most uncertain about. Relevance Select the unlabelled documents the predictive coding system thinks are most likely to be responsive. Both Uncertainty and Relevance are forms of active learning, in which the output of the predictive coding system guides the choice of training examples. In contradistinction, random selection is sometimes referred to as passive learning. There are other possible methods (for instance, we could ask the subject matter expert to search for new training examples; or one could seek to diversify the selection), and variations and mixtures of the above. But here we will look at these three only, and each in its simplest form. All three of the above methods are used and advocated in e-discovery practice. Uncertainty is perhaps the predominant mode, but Herb Roitblat (among others) is a supporter of random or passive selection. Relevance-based selection, meanwhile, is use in the “continuous active learning” advocated in Gord and Maura’s paper, and is a component of continuous ranking method deployed by Catalyst (along with a mix of complementary selection methods). Which method improves classifier accuracy with the least training documents? Which method achieves production recall with the minimum total coding effort (both training and review)? In protocols where no document is produced without human review, these criteria are distinct. Here, the goal of classifier improvement is reduced review effort; but at some point, the marginal reduction in review cost may be less than the additional cost of training. Moreover, each likely-responsive training document is one fewer document to be reviewed. This is the motivation of the continuous approach: training and review are the same (continuous) process, and likewise this process “continues” until sufficient relevant documents are found. Nevertheless, in this post, I am only going to consider which selection method improves classifier accuracy most efficiently. Besides avoiding the complexity of a fuller cost model, this choice allows us to analyze classifier effectiveness in isolation. I hope to examine total production cost in a later post. Balanced Randomly sampling an equal number of responsive and non-responsive training examples at iteration. The experimental data I’ll use for this study is the RCV1v2 dataset, a standard dataset for text classification work. RCV1v2 consists of slightly over 800,000 Reuters newswire articles, annotated with 103 hierarchical news categories. The data is, therefore, not typical of e-discovery data; but in compensation, it is relatively free of noise, provides many topics to investigate, is fully annotated, and is freely available (so please try replicating my results!). Experimental details: I use the tokenized version of the dataset, from Online Appendix 12. The classifier is Vowpal Wabbit version 7.4, with the flags --loss_function=logistic --learning_rate=2 --passes=1 --raw_predictions. All methods, including the “balanced” method, start off with an identical random sample of 100 documents. Subsequent iterations are of 100 documents each, up to 1500 documents. The target set from which training examples are drawn is a random sample of 200,000 documents; a disjoint random sample of 20,000 documents is used as the test set. The evaluation metric is Maximum F1; that is, the highest F1 achieved across all cutoffs of the ranking on the test set. Two things stand out from these results. First, the Uncertainty method (solid green line) outperforms the Random and Relevance methods (red and black lines) in almost every case. 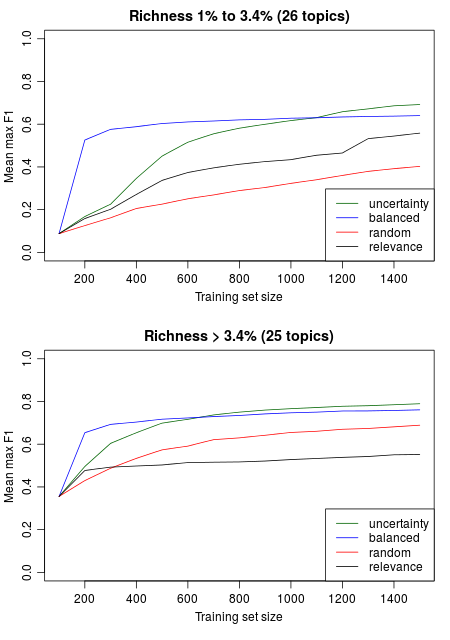 And second, the Balanced pseudo-method (blue line) performs as well as the Uncertainty method for larger training sets, and better for smaller sets on low richness topics. In fact, the richness of training data of the Uncertainty method follows the Balanced method quite closely in most cases; and it is when Uncertainty has fewer positive examples than Balanced that the former method underperforms the latter. Since the Uncertainty method selects training documents that it predicts are 50% likely to be responsive, it is not surprising that it creates a relatively balanced training set; perhaps balance is as important as the selection of uncertain documents per se for Uncertainty’s superior performance. A closer examination of the Random and Relevance methods confirms the importance of training example balance. Random sampling produces approximately the same richness in the training set as in the collection, and does very poorly with low richness topics, though not so badly with higher richness ones. Conversely, the Relevance method does respectably for low richness topics, but poorly for high richness ones. Indeed, for the latter topics, many selection iterations produce almost solely responsive examples. Of course, this is in part what the Relevance method sets out to achieve; but the effect on classifier effectiveness is marked: for several high-richness topics, classifier effectiveness under the Relevance method actually decreases with additional training data. 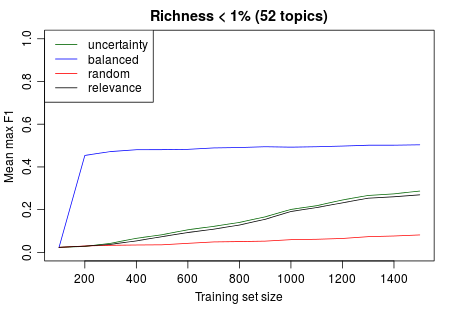 The trends we observed previously are confirmed: Relevance outperforms Random selection for low richness topics; Random outperforms Relevance for high richness topics; but Uncertainty outperforms both methods in both conditions. Balanced selection quickly rises to its asymptotic effectiveness, suggesting that one of the main challenges early in training is to find sufficient responsive training documents (though examining the results of the Relevance method for individual topics in the first figure alerts us of the danger of getting “stuck” in a sub-topic by trying too directly to focus on responsive training examples). With longer training runs, though, the Uncertainty method achieves a higher asymptotic effectiveness than Balanced selection—an interesting finding, that suggests Uncertainty selection does work to exclude poor training documents. These results are similar to Lewis and Gale: on such low richness topics, Uncertainty is only marginally better (on average) than Relevance selection. For such low richness topics, though, it is unlikely that the seed set would be created by the tiresome process of randomly sampling till enough positive examples occur. I hope to return to examine these low-prevalence cases with an alternative seed set selection method (such as querying). What conclusions can we draw from this study? First, viewed solely from the proportion of relevant documents found (and ignoring questions of possible bias), the Random selection of training documents is a poor choice, unless richness is quite high (say, at least over 5%, preferably over 15%). 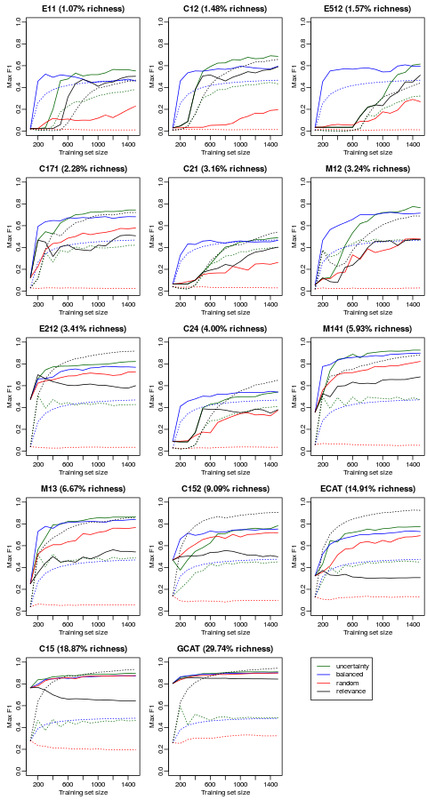 In terms of achieving classifier performance, the Relevance selection method is also a poor choice, except for very low richness topics (below 1%). For classifier performance itself, the Uncertainty method is the clear winner amongst the methods considered, outperforming even the unimplementable Balanced method for larger training set sizes. As mentioned above, though, what we generally care about in e-discovery is not classifier quality itself, but the cost to achieve a certain recall (that is, find a certain finite number of relevant documents). In protocols where every produced document must be reviewed, selection methods that pick more responsive documents for training are preferable (other things being equal), because they leave fewer documents for review. I hope to examine the efficiency of the different models under this cost model in a later post; for now, we can note that under such a model, the Random method will look even worse, the Relevance method somewhat better, since they produce low and high (respectively) richness in their training sets. Finally, note that the Random, Uncertainty, and Relevance methods are implemented here in their simplest and “purest” versions. For the Uncertainty method, for instance, it would be possible (and perhaps preferable) to draw a sample of documents from around the point of maximum predictive uncertainty, rather than exactly the 100 most uncertain documents. Or one could simply combine all three methods, drawing a certain number of training documents by each method, and perhaps adjusting the mix as the training went on. Each method might then supply some of the wants of the other. For now, though, it appears that (at least for classifier quality), Uncertainty selection is the method to beat. Thanks to Gord Cormack, Maura Grossman, Dave Lewis, Jeremy Pickens, and Herb Roitblat for comments which helped improve this post. The opinions expressed here, of course, are my own, and not theirs.